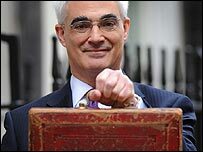 Chancellor Alistair Darling unveils big increases in tax on alcohol and high polluting cars in his first Budget. What will Mr Darling's Budget do for the environment? Drivers of gas guzzling and heavy polluting cars will face a new £950 tax from 2010, Alistair Darling announces. The chancellor cuts growth forecasts for this year and the next - and the budget deficit is set to grow sharply. Public health chiefs welcome tax rises on alcohol, but say there is a way to go before it influences drinking habits.